Lynn Capouya cannot resist picking up trash in an area she will soon be landscaping. Sunset Dr Bridge spans the I-405 behind her. Long before she became a landscape architect, decades before she landscaped schools, ports, airports and parks, Lynn Capouya gathered discarded Christmas trees. For Capouya and her team, however, finding that color does not necessarily mean creating lush gardens and sweeping lawns and towering foliage. Just as important might be devising a planting scheme that avoids distracting drivers or avoids the threat of fire blight or requires little maintenance. 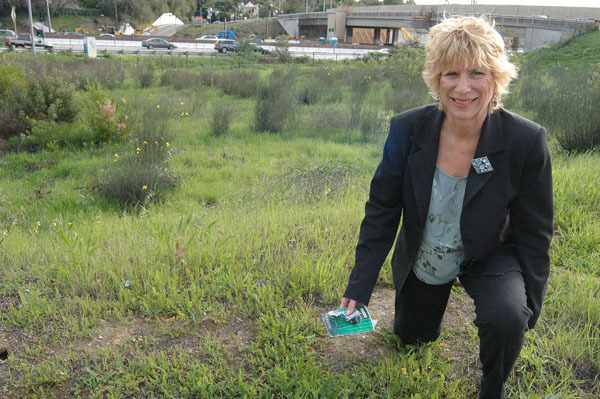 These were major concerns for Capouya and her team as they developed the landscaping design for the widened I-405 Freeway through the Sepulveda Pass. Complicating her task, some of the areas that contained trees will now be too narrow for them. Some sidewalks that featured trees will now have extensive utilities under them, restricting the space for tree roots. Some large trees will be replaced with smaller trees, because of their greater chance of survival. Landscape architects such as Capouya must recommend a palette of plants and trees that addresses community input, project limitations and plant viability. Working within these goals, some popular plants do not make the cut. For example, Capouya ‘s team will not recommend uncommon or hard-to-locate species. They ignore trees that drop a large quantity of seeds or leaves. “When we pick a plant, we have to pick one that is resilient in its environment,” Capouya explains. Take the popular oleander, for example. Capouya has not planted an oleander in 10 years because the plant has been ravaged by the bacterium Xylella fastidiosa, better known as leaf scorch or fire blight. An overriding concern for Capouya during the design process was the lack of water in the Sepulveda Pass and local agencies’ request that whatever was planted require no irrigation. In terms of budget, the I-405 project is the largest project she has undertaken. Fortunately, Capouya has been developing landscaping plans for public areas almost since the Montgomery, Alabama, native became a landscape architect in 1981. “My first project in 1982 was a Veterans Administration hospital in Birmingham, Alabama,” Capouya recalls. “My second project was a military hospital in Dayton, Ohio, so I pretty much grew up on public facilities.” The University of Arizona graduate has worked in California since 1982. “There is a whole familiarization with another set of standards, such as maintainability and sustainability,” notes Tim Mann, a registered landscape architect and a senior associate with Capouya’s firm. “We have to consider what will happen to what we install over time.” This is a particular concern because public projects tend to remain longer than private projects. “How is the landscaping going to represent the area that drivers are passing through?” Mann asks himself as he works. That balancing act between memorable landscaping and driver safety is what interests him. The landscaping is not just for the drivers on the I-405, it is also for the surrounding neighborhoods. They are now feeling exposed – and blighted – they need to have a pleasant experience as they drive and live adjacent to the I-405 freeway. Ms. Capouya should be informed that the residents of the area were promised in a legal document that landscaping would be provided as a buffer for freeway noise and an aesthetic enhancement to mitigate the impact of the massive and brutal denuding of the Sepulveda Pass area between Wilshire and Sunset. Also, would someone be so kind as to identify which public agencies demanded that no irrigation be provided for the landscaping. Residents were promised attractive landscaping, not limited to plants that can live without water, which is a no win limitation. Shameful. There is no excuse to set up this huge project without provisions for adequate irrigation. Obviously, if the pipes are not placed now, it will be “cost-prohibitive” later…it will never happen in the future. What are the actual large plants or trees that will provide the much needed noise barrier and pollution control to protect the neighbors of the freeway along the Sepulveda Pass who pay well above the average property and other taxes to ultimtely fund all this exercise.